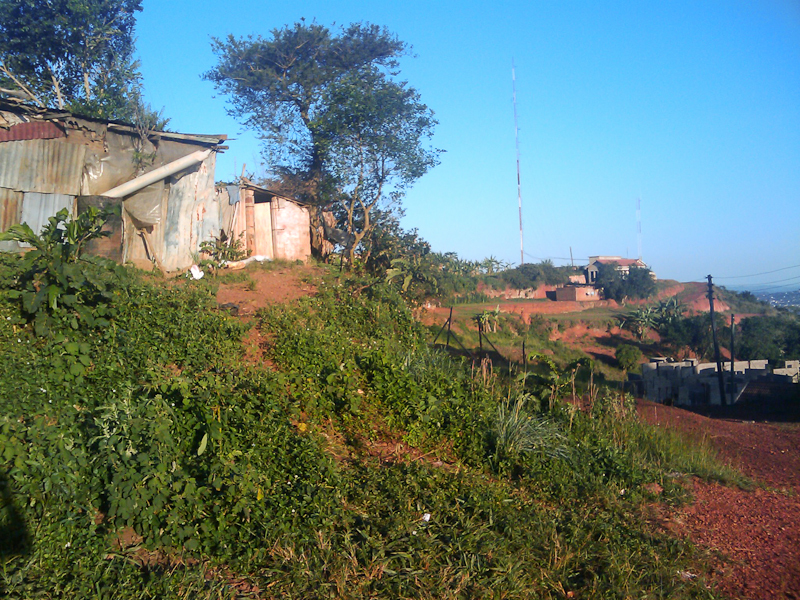 In the afternoon we asked the driver to drop us at the top of a hill near our house. 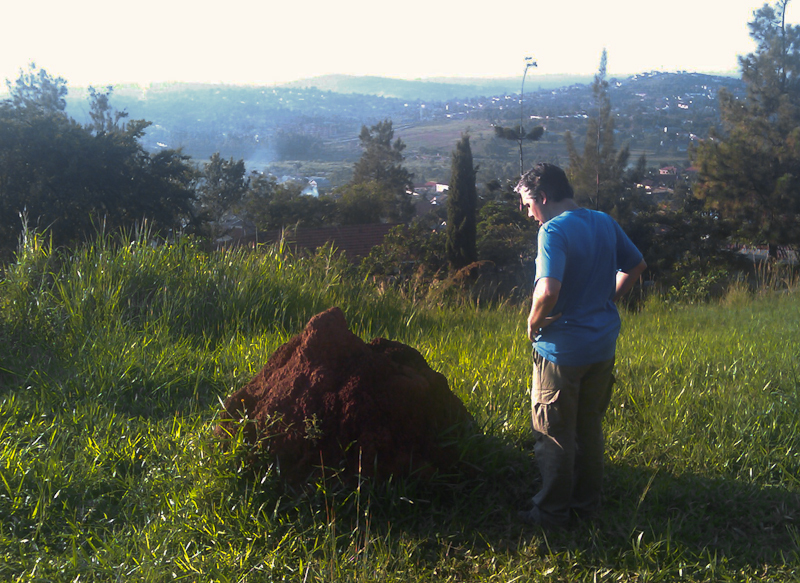 There were many large termite constructions, and we had a good view around Kampala. We realized today that the city is also a smell experience. 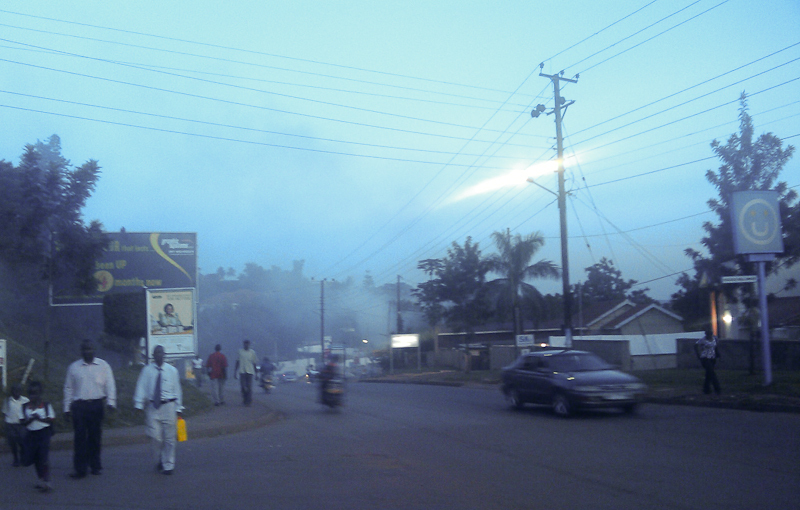 You smell burned stuff, car smoke and dust, so much that a gas mask would be useful. From the top of the hill you could see the smoke everywhere. We wonder why they do it. I guessed it could be to make mosquitos go away, but I will ask about that. We walked for almost two hours going down to the place where we had dinner. During that time it got dark. It’s hard to see much at night, since there aren’t really street lights. Sometimes in the sidewalk there would be a hole so large you could fall inside. We passed a huge crowded market selling clothes. There were thousands of people. There seem to be a lot of people employed in security firms. I saw over a hundred people walking towards one such company, all in blue uniforms. They were coming from all directions. I guess they all start their shift at the same time. But you see this because people walk. They don’t drive. Even the streets can be full of cars, not so many people own them, so people walk, or they ride a small (bus) van or a taxi motor bike. After the long walk we had dinner in a plaza surrounded by 9 or 10 restaurants. When we sat we were surrounded by waitresses from each restaurant trying to convince me to eat their food. There was Cuban, chinese, lebanese, indian… They are always very respectful, shy and smily, and say “hello sir”. I attached some photos I took with the G1 phone I’m testing.